These easy soup recipes will cheer you up in any mood. Easy soups are a great way to provide your family a filling and nourishing meal. Homemade soups are any day better than the packed ones. You will find here healthy soup recipes, which can be prepared quickly, without much effort and most important, with ingredients that are easily available. Whether you want a great soup recipe like an easy French onion soup, before a fancy meal or you want an easy vegetable soup, for days you don't feel like cooking or are not well, you will find an easy soup recipe here for you. Easy soups don't just provide the best nutrition but are so good for people who fuss about food. In every house you will find at least one member who doesn’t like a particular vegetable or two. Especially kids give their moms a hard time. I feel pureed soups are the best way to feed such kids. The taste and texture is all good. So you can become the sneaky chef and give your family the nutrition they need. I do believe that homemade stocks give the best flavor to your soup recipe, having said that I think the readymade broth and stocks available are good for convenience purpose. Occasionally you can use bouillon and stock cubes. I have included the easy vegetable stock recipe and easy chicken stock recipe below. If you cannot arrange for any stock, please use water instead. Have fun cooking these healthy soup recipes! Minestrone soup - A Vegetarian Minestrone recipe. Pureed vegetable soup - a pressure cooked soup recipe, ready in minutes, low fat and packed with nutrients. * Nutritious stock - apart from adding flavor to your soup, the stock provides nutrition as well. Stock is prepared by adding vegetables and/or bones and this makes it rich in minerals and vitamins. When you use this stock along with the other fresh ingredients, your body is provided with double nutrients. Those from the stock are easily absorbed without having to digest and break down the meat and vegetables. So if you are making stock at home, don't hesitate to throw in whole vegetables in it, instead of just trimmings. * Vegetable Soups - are ideal for people who are on a diet for weight control. Healthy soups are filling and if you cut down on the fat content, you get the most balance meal. 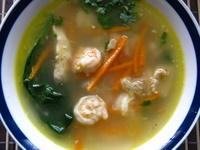 * Chicken Soups or fish soups - are a good protection and cure against flu and cold. * Soups can be as humble or as extravagant as you want them to be. You don't need specific ingredients to make a soup. Just use whatever you can lay your hands on. * Soups for detoxification - In the current living circumstances, you tend to get stressed out for various reasons. Stress increases the acidity in the body. Vegetable soups can help by increasing the alkalinity of the body and thereby eliminating all toxins. * Soups are ideal for people with chronic constipation. Use vegetables with high fiber, to make your soups. Regular consumption of soup will lead to clear bowel movements. This comforting soup recipe is a perfect choice for any weather, especially cold. It is in fact the best antidote for a cold or cough. A healthy chicken soup recipe containing just 2 tsp of oil and even that can be avoided. You do need a good chicken stock for this one. Guess what, once I had no chicken stock and I wanted to make this soup. I did not have the patience to slowly cook the stock for 1-2 hours. So, I figured out a very easy way to make the quickest chicken stalk, with a good flavor, in a pressure cooker, in just 20 minutes. Sounds good? Of course there is always a choice to get one ready made from a super market but I somehow like the stock to be made at home. Take a 5 liters pressure cooker and pour about one liter water in that. Now add some chicken bones, 2 onions (quartered), 2 carrots (roughly diced), 1 stalk of celery (roughly chopped), a few fresh coriander stalks, a few spinach stalks (hard ones), a bay leaf , a few peppercorns, some dried parsley and anything else that you can think of. Pressure cook until the first whistle blows and then simmer for about 20 minutes (in the cooker itself). Let the pressure settle down, then open and strain it. This will be the base for our soup. The ingredients our totally your choice. You can add mushrooms or beans or anything you fancy. Heat the oil in a saucepan, add the garlic and onion. Saute till soft. Now add the carrot and stir for a few minutes. Now add the hot stock, chicken and prawns. Let the soup boil for 3-4 minutes or until the prawns are cooked. Add the salt and pepper. Also add the blanched spinach leaves. Cook for another minute and leave it to stand a few minutes. Add fresh coriander and serve hot. Isn't this an easy and tasty soup recipe?